I love going to the farmers market. You can see all the amazing fruits and vegetables that are in season and you get to meet the people who actually grew them. The whole experience is really inspiring for me and I always come home with new recipe ideas! This salad is the result of last week’s trip. I almost never eat pears. But they are AMAZING in this salad. 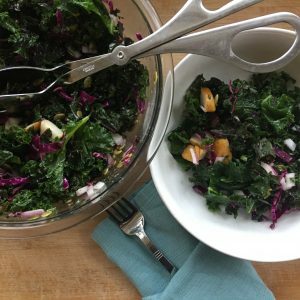 Add the kale on top of the dressing and the rest of the salad ingredients. Mix well until everything has been coated by the dressing. *If you don’t plan on serving the salad right after making it, mix the dressing in a separate container and pour over later.